» Nuclear power is the fourth-largest source of electricity in India after thermal, hydroelectric and renewable sources of electricity. » As of 2013, India has 21 nuclear reactors in operation in 7 nuclear power plants, having an installed capacity of 5780 MW and producing a total of 30,292.91 GWh of electricity while 6 more reactors are under construction and are expected to generate an additional 4,300 MW. » India's and Asia's first nuclear reactor was the Apsara research reactor. Designed and built in India, with assistance and fuel from the United Kingdom. » Apsara reached critically on August 4, 1956 and was inaugurated on January 20, 1957. » India's domestic uranium reserves are small and the country is dependent on uranium imports to fuel its nuclear power industry. » Since early 1990s, Russia has been a major supplier of nuclear fuel to India. » Large deposits of natural uranium, which promises to be one of the top 20 of the world's reserves, have been found in the Tummalapalle belt in the southern part of the Kadapabasin in Andhra Pradesh in March 2011. » The Atomic Minerals Directorate for Exploration and Research (AMD) of India, which explores uranium in the country, has so far discovered 49,000 tonnes of natural uranium (U3O8) in just 15 kilometres (9.3 mi) of the 160 kilometres (99 mi) long belt and there are indications that the total quantity could be three times that amount. » After the 2011 Fukushima nuclear disaster in Japan, "populations around proposed Indian NPP sites have launched protests, raising questions about atomic energy as a clean and safe alternative to fossil fuels". There have been mass protests against the French-backed 9900 MW Jaitapur Nuclear Power Project in Maharashtra and the Russian-backed 2000 MW Kudankulam Nuclear Power Plant in Tamil Nadu. The state government of West Bengal state has also refused permission to a proposed 6000 MW facility near the town of Haripur that intended to host six Russian reactors. Who invented the nuclear power plant? Enrico Fermi is considered a major figure in the discovery of nuclear energy. This physicist born in Rome, Italy was the first scientist to split the atom and his research later led to nuclear power generation. Together with Leo Szilard, Fermi discovered the first nuclear reactor that caused nuclear chain reactions. How many countries have nuclear power plants? There are thirty countries in which nuclear power plants operate while only France, Belgium, Hungary and Slovakia use them as the primary source of electricity, although many other countries have a significant nuclear power generation capacity. Who has nuclear power countries? In order of acquisition of nuclear weapons these are: the United States, Russia (successor state to the Soviet Union), the United Kingdom, France, and China. Since the NPT entered into force in 1970, three states that were not parties to the Treaty have conducted nuclear tests, namely India, Pakistan, and North Korea. What is the name of India's first Nuclear power plant? Tarapur Atomic Power Station, started in 1962 and operational in 1969. 1.Narora Atomic Power Station is located in which state ? Narora Atomic Power Station is located at Bulandshahar District of Uttar Pradesh. Narora Atomic Power Station started operating from 1 January, 1991 and unit 2 started operating from year 1992. 2.Which of the following Atomic Power Station is located in Tamilnadu ? 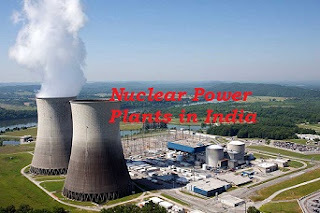 Kundankulam Nuclear Power Plant is located Tirunelveli district of Tamil Nadu. The construction of plant was started from 31 March, 2002 and started operating from year 2013.It is first nuclear power plant to use the imported PWR technology. 3.Rawatbhata Atomic Power Station is located in ……………………..
Rawatbhata Atomic Power Station is located at Rawatbhata of the state Rajasthan and is also known as Rawatbhata Atomic Power Station. Rajasthan Atomic Power station (RAPS) construction was started in year 1963 and the plant started operation from year 1973. 4.…………………………. is India’s first and largest atomic power station. Tarapur Atomic Power Station is India’s first and largest atomic power station. It is located near Boisar of Thane District of Maharashtra. Tarapur Atomic Project was started in year 1962 and the plant started operating from year 1969. For the construction of the TAPS a contract was signed in between Government of India, United States and International Atomic Energy Agency. 5.Kalpakkam Atomic Power Station located in which state ? Kalpakkam Atomic Power Station is located at Kalpakkam south of Chennai, Tamil Nadu. Kalpakkam Atomic Power Station is also known as Madras Atomic Power Station (MAPS). MAPS construction started in year 1970 and started operating from 24 January, 1984. 6.Which is located in Karnataka ? Kaiga Atomic Power Station (KAPS) is located at Uttar Kannada district of Karnataka. KAPS construction started in year 1989 and started operating from 16 November, 2000. Kaiga Atomic Power station is the third largest nuclear power plant in India. KAPS has total four pressurized heavy water reactors with capacity of 220 MW each. Kakrapar Atomic Power Station (KAPS) is situated at near Surat city of state Gujarat. Kakrapar Atomic Station was started constructing from year 1984 and started operating from 6 May, 1993. 8.Banswara Atomic Power Station located in which of the following state ?